Liberty London is working with Amplience to improve the look, responsiveness and feel of the website on all devices, and increased customer engagement and workflow efficiency as a result. Liberty London, one of the UK’s most iconic department stores, attracts shoppers who expect a world-class shopping experience. The luxury goods market continues to grow in the UK despite challenging economic conditions. Liberty recognizes that enhancing its online offering to keep pace in a competitive environment is essential to maintaining growth and market share. Customers no longer just demand impeccable in-store service, they also expect an incredible online experience. In order to meet customer expectations, Liberty began rethinking all aspects of its online offering. However, in an ever-evolving sector such as luxury retail, speed of deployment coupled with build accuracy were of paramount importance. The mantra around the online upgrade at Liberty became “Build it once; build it accurately”. Understanding the need to evolve and modernize its heritage brand, Liberty made the decision to improve its online presence. Liberty turned to Amplience due to its deep knowledge and expertise of how to make content work in Salesforce Commerce Cloud and its proven track record of improving efficiency of content creation. The goal of the replatform was to increase efficiency of content creation, empower teams across the business by providing the right tools that integrated seamlessly with Salesforce Commerce Cloud and to improve the look, responsiveness and feel of the website on all devices. In under two months, the Amplience project team successfully deployed Dynamic Content,Dynamic Media and Content Hub, integrating the Amplience platform seamlessly with Salesforce Commerce Cloud. Liberty has fully embraced the scheduling aspects of Dynamic Content which has triggered a whole set of restructuring of the in-house creative team. Due to how user-friendly the scheduling tool within Dynamic Content is, the content team at Liberty now has autonomy over the whole process of creating, editing and scheduling content for the website, which historically was the responsibility of the design team. This has freed up time for designers at Liberty to focus on their primary roles and increased the velocity at which content is delivered. The implementation of Amplience solutions has reduced the time it takes to produce new content by 66 per cent and has meant that the typical turnaround time of creating a home page is now on average two hours compared to a full working day with the previous system. Telling the “Liberty story” through content truly separates the brand from its competitors. In a short space of time, Dynamic Content has allowed the in-house team at Liberty to cultivate brand identity by increasing the velocity at which editorial content on the site is published. This has led to major improvements in SEO, mobile traffic and team productivity. In today’s ever-changing market this functionality is crucial for responding to trends with engaging content. This productivity gain is also helped by the fact that Dynamic Media is now being used to streamline asset management and serve up all imagery, web fonts, PDFs, GIFs and rendering templates on Liberty’s website. Its flawless integration with Dynamic Content means that the speed of content creation has increased significantly, and publishing bottlenecks are now a thing of the past. “The Amplience success team has been crucial in supporting our replatforming and redesign. Considering we are doing everything in-house, the integration was incredibly quick and simple,” explained James Finch, Senior Digital Designer at Liberty. “It is great that we have a CMS platform that works and understands our business needs. The uptime is second to none and the integration Amplience has achieved with Salesforce Commerce Cloud has seen productivity skyrocket. 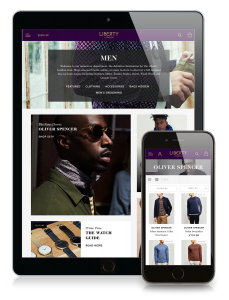 We are publishing content more consistently and have improved the commerce experience across all devices. Dynamic Content has empowered our business to do more. By streamlining our content production my designers now have more time to focus on creativity and problem solving. Having a partner in Amplience that understands how content works in Salesforce Commerce Cloud is invaluable,” concluded Finch. Despite the huge improvements Liberty has made to its online functionality, in such a fast-paced sector, it cannot afford to stand still. Liberty is currently planning to further integrate Amplience e-commerce and marketing solutions within the next 12 months. Some of the planned improvements include increasing the website speed, simplifying aspects of design and continuing to enhance mobile imagery. With features such as Point of Interest and Hotspots, Amplience will continue to support Liberty in future proofing and maintaining the premium feel of Liberty’s online presence.